Database systems: Microsoft SQL Server, MySQL, Oracle, DB2, etc. File databases: DBase, FoxPro, Access, Excel, text files, etc. Click the Open Data Source button ( ) to set up a connection to a database table (see database connectivity to learn more about the different ways of setting up a database connection). After your conversion is set up, you can run the process by pressing the Run button ( ) and then view the results of the conversion as a database table by pressing on the Browse button ( ). A list of output fields is automatically generated from the list of the input fields. The type and width properties of the output fields are initialized automatically. You can make any changes at any time to the output dictionary. 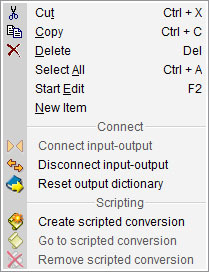 You can add new fields, remove existing ones, edit field properties, load a dictionary from a dictionary file by pressing the Open Dictionary button ( ) or import a dictionary from a database table structure by opening an appropriate table using the Open Database Structure button ( ) button located to the right from the field list. string: alpha numeric values; the maximum width allowed for a value of this type depends on the limitations of the database system you are connected to. Click on a Width cell to edit it. numeric: numeric values; there are five sub-types for this type: short, long, float, double and currency. Click the drop-down arrow in the Width column to select the appropriate sub type. alphanumeric: A string value that only allows letters and digits. To change a field's type, click an the drop-down arrow button in the Type column and select the appropriate type. Type and width can also be changed in the properties pane at the bottom of the output section. Can be NULL - allows the field value to accept empty (uninitialized) values. Unique - the underlying database system will not allow entry of duplicate values for the field. Auto Unique - the unique value is automatically generated for this field for each new record. Primary key - a field that uniquely identifies the rows in a table. Default value - a constant, which the field value is set to if no other value was provided. An output field can be initialized from a connected input field or through a custom script. - the output field connected to to an input field. - the output field is not connected to an input field. 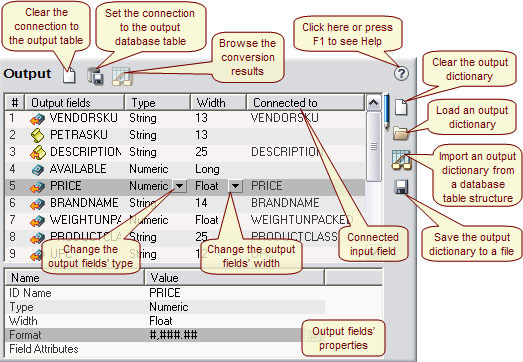 - the output field is connected to an input field and is then customized through a script. - the output fields' value is defined through a script (can be a function of multiple input fields). TextConverter Version 4 features a separate window for output field properties. Here you can customize them to your liking. The new version also features some new, powerful custom setups that offer even more control over your output, such as using calculated inputs and composite output fields. Calculated input fields allow you to take multiple input fields to generate a single output, using script. Composite fields allow you to split a single input field into multiple outputs.